Coming less than three months after the big one in Detroit, the New York International Auto Show used to be a peripheral event on the automotive calendar. Not any more. 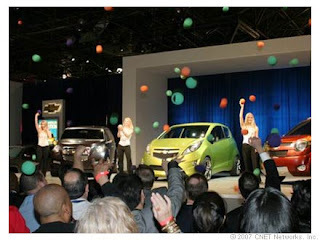 We already know that New York is going to be a bonanza event: General Motors alone has six production models making their world premieres, plus a "closely guarded world concept," which will follow on the heels of the Chevy Volt. Other new models on show will be the all-new Infiniti G37 coupe, the Lexus LX570 luxobarge, and the Suzuki SX4 sedan. On the performance-car front, we're going to be getting a first-hand preview of the Honda S2000 CR, and a hands-on look at the Nismo-tuned Nissan 350Z, the Ford Shelby GT500KR, and the Corvette-based Callaway C16 Cabrio. Other highlights of the show include new concept cars from the likes of Hyundai and Infiniti, the results of the automotive journalists' 2007 world car of the year, and all the latest roadworthy gadgetry from the world of Car Tech. We'll be on-site at the Jacob K. Javits Convention Center in Manhattan to bring you blogs, videos, and photos of all the show-stopping action live from New York.